When systems with multiple string inverters develop problems, it is difficult to detect that one inverter output is low from the power meter alone because it is a small percentage of the total. However, left undetected, the lost revenue can be considerable. PowerWatch continuously tracks power output from each inverter and compares them to each other. Under the same solar conditions, power from each inverter should closely match. If a bad string connection, blown fuse or bad panel develops it immediately becomes obvious by examining the daily power graph. Scroll over the inverter graph to get its ID then use other tools like the ANALYZER - Inverter Status to determine the cause of the problem. Identify hard to find intermittent problems like dropout from grid issues or shading effects using the 30 day power logs. Compare the output of each inverter under varying solar conditions. Use PowerWatch to support warranty claims with the the inverter OEM for faulty equipment. Let SolarVu automatically detect and warn of potential problems. Each night SolarVu compares the daily energy from each inverter and computes the energy ratio of the highest to the lowest which should be 100% if perfectly matched. An energy ratio alarm can be enabled to warn if any inverter is below the normal range. This saves time with manually checking the graphs when everything is normal. With the confidence knowing the site is operating at full capacity, expensive routine site maintenance checks can be eliminated. 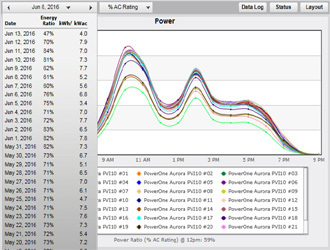 Access PowerWatch from the Analyzer tools and start using it to locate hard to find problems on your SolarVu site. Watch the video showing an example of using PowerWatch on a 250kW site with 25 inverters showing how to find a bad string.